From 2-4 November around 130 people gathered in Forum de Beyrouth in Lebanon for BDL Accelerate 2016 HealthTech Hackathon to disrupt the health and medical sector. Alltogether 21 projects were presented on Friday evening during the final presentations on Innovation Stage @ BDL Accelerate 2016 Conference. Jury chose FacePhysio, an app providing targeted facial muscle recovery, as the overall Winner of the HealthTech Hackaton and gave them a prize of 10 000 USD. BDL Accelerate 2016 HealthTech Hackathon was organized with the help of Banque du Liban, Garage48 and HackingSurgery. 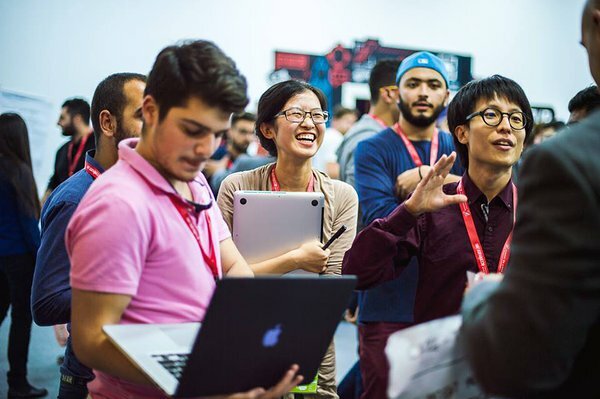 BDL Accelerate 2016 HealthTech Hackathon was the very first hackathon event for Garage48 to organise in Beirut, Lebanon. Among local Lebanese participants there were also talented participants chosen from Garage48 community in Estonia & Eastern Europe and Touch Surgery community health sector specialists from UK. This combination of talented young participants brought great results, starting from serious projects like Graft Alert (Implantable device to monitor graft blood flow and alert doctor and patient of potentially failing graft) and ending with more daily apps like Dr. Jones (An app connecting you with a friendly doctor who speaks your language wherever you are in the world. Feel safe whenever, wherever). “From the moment I walked in I’ve sensed a great amount of good energy. The conference is buzzing with people downstairs, but when you walk into the Hackathon area, you can feel the temperature in the room rising. I am literally blown away by how much these teams have achieved in such limited amount of time. It is mind blowing to witness health tech and hardware solutions develop in front of me. The future of healthcare is looking bright and with everyone bringing their own experience, we can all improve. It has been a powerful and inspiring event,” said Axel Sylvan, Doctor, Founder, CM & PO of My Recovery. On Friday jury had a tough decision to choose winners from the 21 projects presented. This event the jury and mentors were also amazed by a talented Lebanese designer Jad Haidar who we decided to name as the "Most Inspirational Person" of that event. Our app provides targeted facial muscle recovery and it makes treatment for facial weakness fun and socially acceptable. (Booking.com for home-nurses. An App that connects patients and their families with nearby qualified home-nurses at competitive prices. An AR-based application that allows dentists to see a 3D model superimposed on the patient while operating. Implantable device to monitor graft blood flow and alert doctor and patient of potentially failing graft. This application connects patients, pharmacies and doctors in order to store medical data and to provide easy access to the users. Automated pill dispenser for easy scheduling, alerting and monitoring users medical prescriptions routines. BacterMap is a service to help doctors prescribe the right antibiotic for the patient to stop abusing antibiotics and save patients time and money. VM-Care is a technology driven preventive health care delivery platform, promoting the preventive care approach compared to the usual reactive systems. Sicky is a medical experience sharing platform for chronic patients. The first step to an always available AI Doctor. Dia.Log : Captures and analyses the dialog between the patient and their health care professional. Allowing for 1) the patient to remember and understand their healthcare and treatment, 2) provides quality control for doctors, and 3) automated diagnostic coding to increase reimbursement to doctors from health insurance companies. SUPP is a solution that helps patients who were recently diagnosed with a long term illness to support each other through an online community that is trusted, anonymous, and secure. Simple, modular, customizable, patient management software & medical database. Medical eCommerce and services, ePrescriptions,Appointments. Dr. Jones connects you with a friendly doctor who speaks your language wherever you are in the world. Feel safe whenever, wherever. We provide an app that helps you monitor your diet and correlate it with your bowel movements to provide individualised reports to assist the well-being of your gastrointestinal tract through an improved diet. E-Rush is our responsive web app that allocates patients to available emergency care beds, saving time, money and lives. A sticker that stores your medical information offline so that the doctor can access it in case of an emergency with not internet needed. Drug Catcher is a simple P.O.S system for pharmacies,which saves the money that pharmacies lose because of expired products. Help truck drivers to stay awake by tracking their eyes and asking to solve mathematical problems using voice recognition.